Increasing the body count, the gore levels and the homicidal ingenuity of his cult horror hit Hatchet, writer-director Adam Green (Frozen; Hatchet; Spiral) throws his splatter generator into overdrive in an attempt to out-slash every other slasher movie ever made with Hatchet 2, which comes to UK DVD and Blu-ray in August from Arrow. Starring Danielle Harris (Stake Land; the Halloween remakes), Tony Todd (Candyman), Kane Hodder (the face behind the mask of Jason Vorhees in the Friday The 13th series) and Tom Holland (writer-director of Fright Night and Child's Play), and featuring cameos by Frozen stars Shawn Ashmore (the X-Men trilogy) and Emma Bell (The Walking Dead) amongst others, the film sees vengeful supernatural killing machine Victor Crowley coming up with ever more inventive ways of dispatching anyone who dares trespass on his little patch of the Louisiana swamplands. 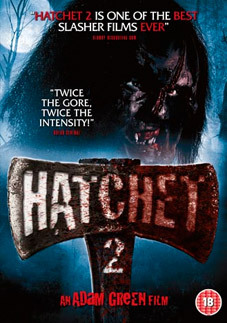 More a continuation than a sequel, Hatchet 2 picks up at the very moment the first movie ended, with feisty heroine Marybeth (Harris) held firmly in the deformed Crowley's clutches and facing a very watery grave. A bit of gruesome eye gouging sees her managing to escape to comparative civilization, where she winds up at the premises of voodoo shop proprietor and illegal swamp boat tour operator Reverend Zombie (Todd). After telling him that Victor Crowley is far from dead and explaining she wants to return to the swamp to retrieve the bodies of her late father and brother, Marybeth convinces the Reverend to accompany her on a journey back to the Crowley shack. Eyeing an opportunity to serve his own needs with regards to the swamp and the Crowley legend, the Reverend sets about recruiting a hardened bunch of hunters to join him and Marybeth on a one-way cruise into the very heart of darkness. Hatchet 2 (cert. 18) will be released on UK DVD and Blu-ray by Arrow Films on 29th August 2011 at the RRP of £12.99 for the DVD and £19.99 for the Blu-ray.